A female prison teacher has today, Monday, been told she faces jail for having a sexual relationship with an inmate behind bars. Mum Samantha Drinkwater, 49, had a fling with the male prisoner for 20 months while working at high security jail HMP Whitemoor in Cambridgeshire. She also tried to smuggle cannabis into the jail and was arrested after the Class B drug was found in her car. Drinkwater was employed by People Plus - an employment support and training services firm - at the time of the offences between November 2015 and July 2017. During the relationship with the prisoner, whose identity is unknown, Drinkwater also smuggled an SD memory card containing music and video past prison guards. Appearing at Cambridge Crown Court today, Monday, Drinkwater sat in the dock dressed in a pink blouse, black trousers and glasses. She pleaded guilty to one count of possession with intent to supply a class B drug. At a previous hearing at Peterborough Crown Court on February 28, Drinkwater pleaded guilty to one count of possession of a class B drug, and to bringing the SD card into the prison. She also pleaded guilty to one count of misconduct in a public office at a subsequent hearing in April. 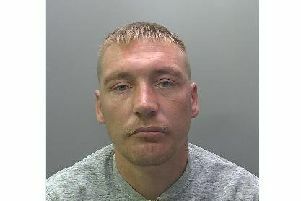 Drinkwater, of Ramsey, was released on bail, and is expected to be sentenced at Peterborough Crown Court on September 10. The Honourable Judge Matthew Lowe said: "A prison sentence is a likelihood in this case."